One of the cornerstones of personal financial management is building responsible credit through the use of credit cards. Many people recognize credit cards as an important test of responsibility, while other users can overspend themselves into unmanageable debts and pay more money in interest as a result. Therefore, it’s important that you negotiate the lowest credit card interest rate that you can leverage. Traditionally, the credit card application process required a constant back and forth consultation between you as a borrower and credit card suppliers as the lenders. This process required you to spend more of your personal time negotiating with providers, and likely cost more money than necessary because providers often dictate what they feel is a fair credit card interest rate plan. If you are young or new to Canada and haven’t yet acquired credit history – you are more susceptible to strict dictations of terms from credit card companies. However, the thing about traditions is that they eventually become outdated. The internet has revolutionized how you get information, how to communicate, and even how to conduct business which provides entirely new ways of getting things done. There are now websites that serves as one-stop shops for personal financial products, including credit cards. These sites allow you to compare credit cards in Canada along with their corresponding interest rates from the country’s leading providers, including some of the lesser known names in the business. The main benefit of having this information all in one place is you are no longer required to meet with each individual provider to haggle over the rates. The information is all in one place, which helps you, find the right credit card for your unique situation without spending so much of your personal time dealing with creditors. In addition to saving you time, these websites can also help you save money on your credit card plan. Creditors assume that applicants are ignorant of the credit card market, and rely on that perceived ignorance to enforce higher credit card interest rates than are necessary. However, with just a few minutes spent online, you have information on credit cards, their benefits, and the lowest advertised interest rates on all competing providers in the area. This information gives you leverage to negotiate a lower interest rate, with the confidence to choose a different provider if one refuses to meet you halfway. Everybody loves to save money especially when you pay more interest than is necessary. 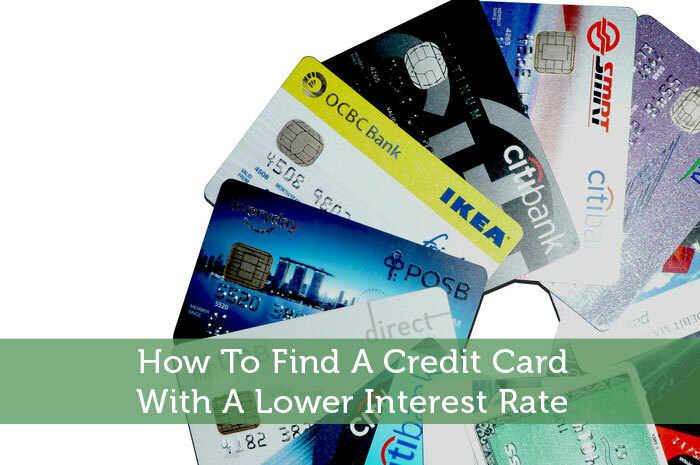 In just a few minutes of browsing online, you can find a lower interest rate that helps you pay only what you spend instead of what creditors can charge. Luckily I’ve never carried a balance and therefore have never really thought about my credit card’s interest rate. I should though! I’m the same way…I don’t pay much attention to the interest rate because it doesn’t mean anything if you pay off the full balance every single month. Still I probably should take the time to ask for a lower interest rate just in case. Those high rates are probably why many people choose to ignore them in the first place. It is just discouraging how high it is. So a smart consumer is just going to do what they can to avoid those interest rates altogether rather than stressed out about how high they are. Good tip Pauline. This is not something I’m aware of, but I’ve never had to transfer the balance on one card to another. When I have used balance transfers it was always from a personal loan onto a credit card. When I had credit card debt, I always looked for cards that offered 0%, but now that I don’t carry a balance, I tend to look for rewards. I always think the best bet is to not carry credit card debt, but if you have it, why pay more interest than you have to? For sure, rewards are a lot more important when you are confident you can consistently pay off the balance each month. If that’s not the case, the interest rate should be your biggest concern. I AM carrying a balance, but tend not to consider the rate overly much. In my experience, rates don’t vary much within a class of cards. That is true to an extent. A lot of cards will vary their interest rate depending on how much of a credit risk you are. I suggest calling your card issuer periodically to try to negotiate a lower interest rate. That is one area that they have been known to budge a bit on. I used to always pay attention to interest rate and still do. You never know what might happen and then you cannot pay off your balance in full. Life happens and being prepared with having the smallest rate available is going to keep you from getting buried. Yes it is important to plan for the worst case scenario. In my case if I absolutely had to I would pay off the balance via my low interest line of credit. That’s one piece of credit that I make a consistent effort to keep lowering the rate for. I agree with your last comment Jeremy, in the past when I had larger balances I was also able to negotiate a discounted rate. If you do carry a balance it can make sense to juggle them at times. If you transfer a balance though it can take discipline not to spend again on the old card. I think you’d have even more leverage if you negotiated those lower rates while you weren’t carrying a balance. The worst that can happen when you ask is that they say no. So it’s worth a shot. Ah I see what you mean, I was talking more about transfering a balance from one card to another. There’s a similar website that I use. credit karma dot com will let you create an account and will simulate your credit score (quite accurately). You can shop and compare credit cards there as well. I’m not sure if their service is available in Canada though. Sounds like a good service. It’s not good to do a hard pull on your credit score too often. So if you can get it simulated fairly accurately, it’s probably worth doing, especially before making moves where a good credit score is beneficial. I no longer carry any credit card balances, but I still make sure to keep track of my cards’ terms and know what’s out there in terms of other options–you never know when you may need to switch things up! I have to admit that the only terms I pay attention to these days is the annual fee and rewards program. I just don’t use all the other features. I’m a big fan of low interest credit cards but if you’ve missed payments or done so really bad things to screw up your credit their isn’t anything that is going to get you a lower rate. This is why I always suggest reading your credit report over for mistakes to keep a clean credit profile. Very true that you may be out of luck with getting a low interest if you don’t have very good credit. You may be stuck paying high interest on your credit card in that case. So important to keep a tight leash on low interest credit cards for that reason. For conscientious people, rewards cards are great. But for forgetful people like me, low interest cards are a little safer. Yep, you need to consider your own personal finances when deciding which type of credit card is best for you. I don’t normally care about the interest rate because I don’t carry a balance, but I don’t think that should be an excuse. If I ever need to carry a balance, it will be too late then! Yep, a lot of people don’t really plan to carry a balance. It just happens, especially when other unexpected expenses all pop up around the same time. So it is best to be prepared for those situations. A lower interest rates can help out a bit. I have no idea what the interest rates are on my credit card because I’ve never paid interest. I guess I should probably know that, but that’s why I have an emergency fund, so I won’t have to use my cards to pay for emergencies. Before I had the emergency fun I had a 0% for 12 months card “just in case”. I hadn’t started my post-masters job and was nervous I might have an emergency. Fortunately I never had to use it. Sounds like you’ve got a good plan in case some kind of emergency happens. In that case I wouldn’t be too worried about your credit card interest rate. Really it’s either going to be super high or fairly high. So either way it’s not somewhere that you ever want to be charged interest fees.